Flos Lamps including the Taccia Lamp by Achille Castiglioni and the Flos Skygarden Pendant Lamp (upper right corner) designed by Marcel Wanders. All Flos Lamps are available in the US through modern design purveyor Stardust with a 110% Low Price Match Guarantee and Free Shipping. 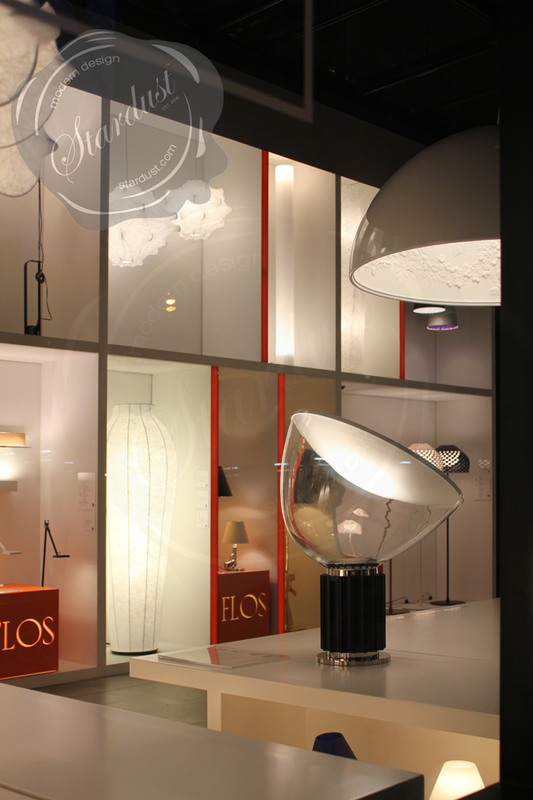 skyGARDEN Flos Lamps stand out because of their quality Italian craftsmanship, beautiful design and functionality. This is a beautiful shot of the Flos Skygarden Pendant Lamp when looking up. Please note the detailed inner lamp diffuser with the logo designed by Marcel Wanders. All Flos Lamps are available in the US through modern design purveyor Stardust with a 110% Low Price Match Guarantee and Free Shipping. The brilliant Skygarden chandeleir looks wonderful whether its switched-on or switched-off. 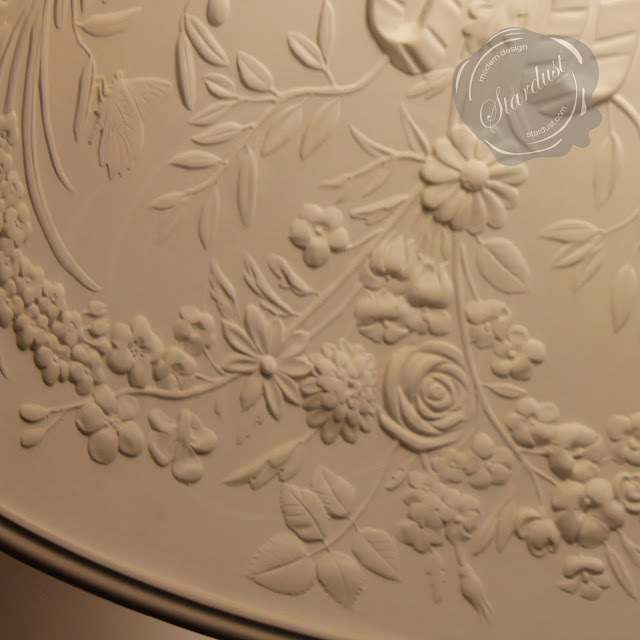 The plain smooth exterior of the diffuser is in great contrast to the intricate patterned detail of the interior which features leaves flowers and branches. 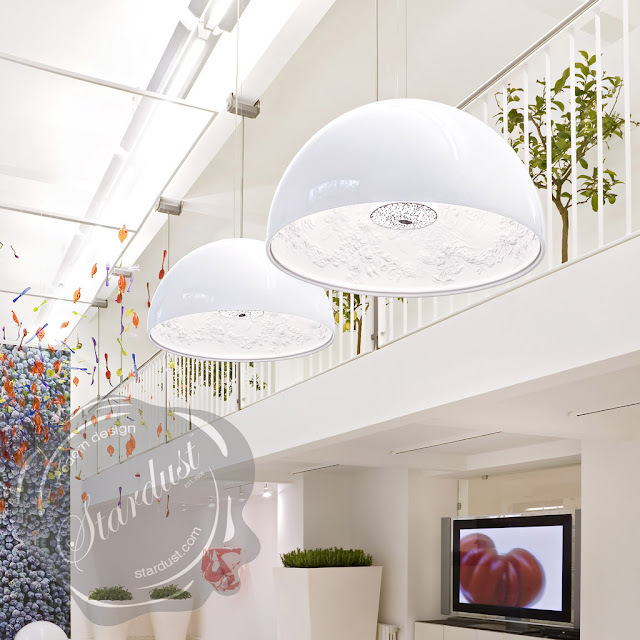 This is another beautiful shot of the Flos Skygarden Pendant Lamp when looking up. 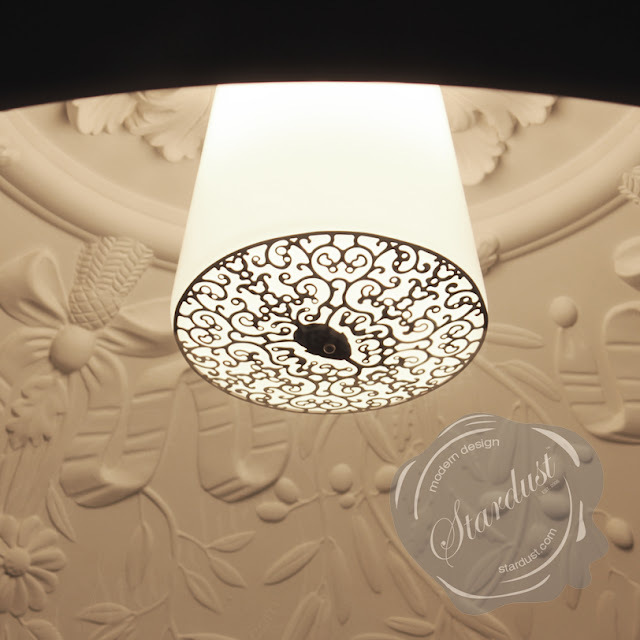 Please note the detailed inner lamp diffuser with the logo designed by Marcel Wanders. All Flos Lamps are available in the US through modern design purveyor Stardust with a 110% Low Price Match Guarantee and Free Shipping. The intricate patterned detail of the Skygarden's interior features a chalk body with wonderful decorations in relief. Designed by the wonderful Marcel Wanders, Skygarden is just an absolutely stunning show stopper. A close-up look of the Flos Skygarden Pendant Lamp when looking up. 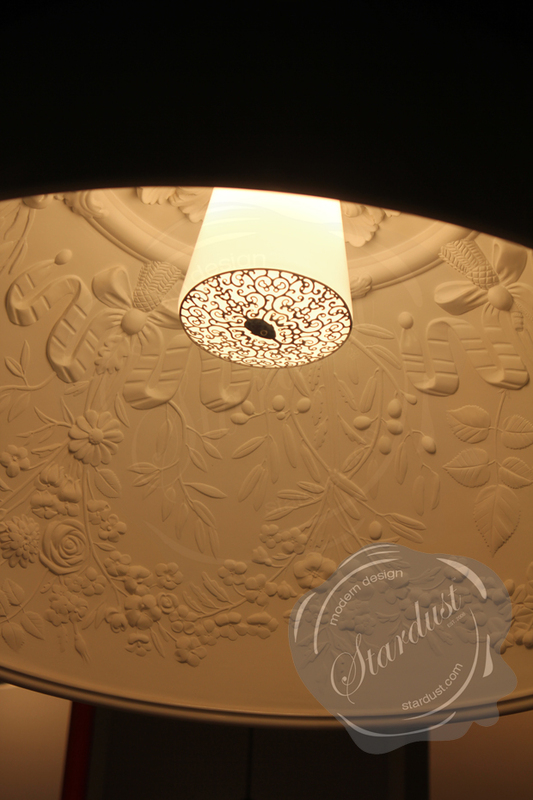 This picture was taken at night with no other lights in the room; the only light being supplied by the Skygarden Chandelier. Please note the detailed inner lamp diffuser with the logo designed by Marcel Wanders. All Flos Lamps are available in the US through modern design purveyor Stardust with a 110% Low Price Match Guarantee and Free Shipping. The Skygarden Lamp in White pictured during daytime! All Flos Lamps are available in the US through modern design purveyor Stardust with a 110% Low Price Match Guarantee and Free Shipping. Two Skygarden Lamps are suspended in the living room of this New York City apartment! All Flos Lamps are available in the US through modern design purveyor Stardust with a 110% Low Price Match Guarantee and Free Shipping! The complete collection of Skygarden Lamps in all available colors. 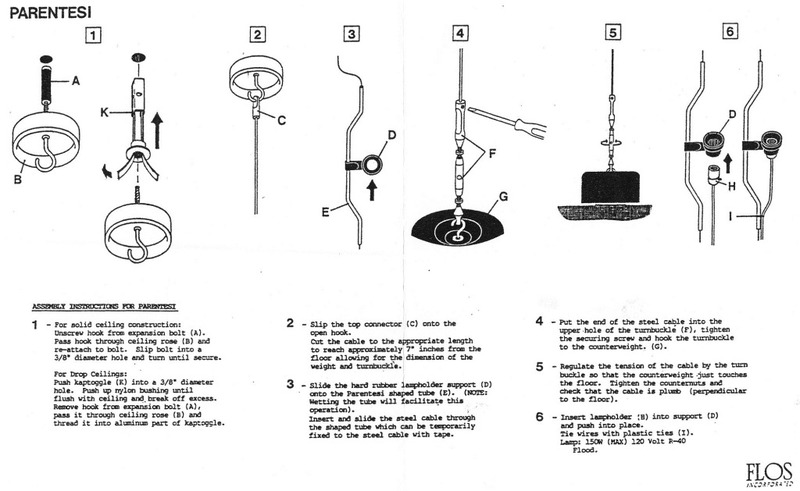 Pictured from left to right is the Black Skygarden Lamp, the White Skygarden Lamp, the Rust Skygarden Lamp and the Gold Skygarden Lamp. All Flos Skygarden Lamps are available in the US through modern design purveyor Stardust with a 110% Low Price Match Guarantee and Free Shipping! A New York City apartment overlooking Central Park features the Marcel Wanders Skygarden Lamp over the dining table. 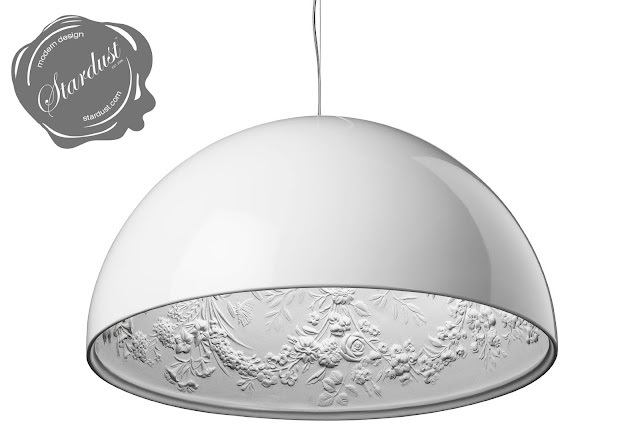 The Flos Skygarden Suspension Lamp by Marcel Wanders is an instant classic! Designed by the wonderful Marcel Wanders, Skygarden is just an absolutely stunning show stopper. Part of the Stardust Modern Lighting Collection; the Skygarden Lamp is in stock for immediate shipping. Marcel Wanders found inspiration for this light from the antique decorated plaster ceiling in his home in the Netherlands. This brilliant suspension lamp looks wonderful whether its switched-on or switched-off. The plain smooth exterior of the diffuser is in great contrast to the intricate patterned detail of the interior which features leaves flowers and branches. The chalk body has decorations in relief inside and a liquid painted exterior in either gold, white, brown or black finishing. Chicago modern apartment re-design with the Skygarden Lamp in Rust by Chicago based interior designers & decorators James Thomas, LLC. Skygarden provides direct light. 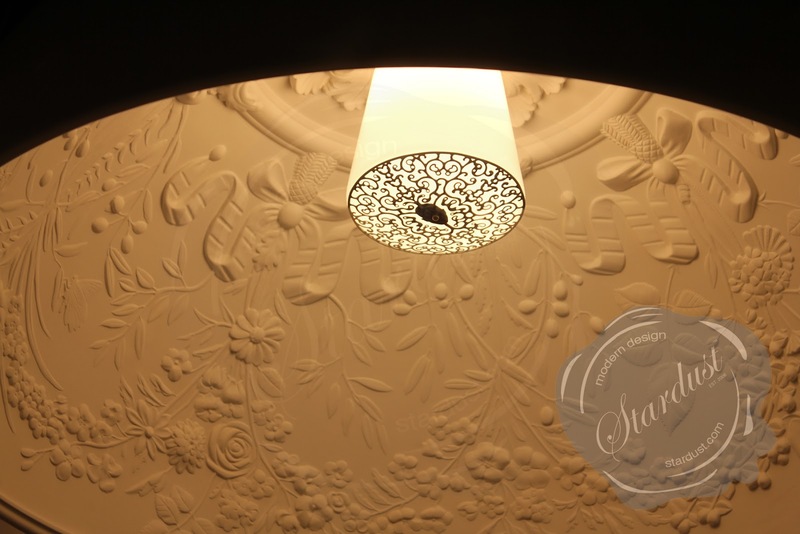 The light bulb cover has a laser cut pattern featuring one of Marcel Wanders design patterns. Skygarden is finished in a metal structure with a chalk white plaster relief. Available in gloss black, gloss white, rust and gold. 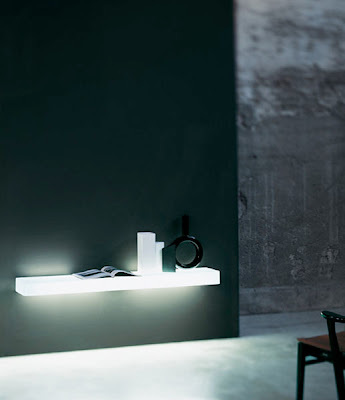 The modern Flos lighting collection is the standard for architects and interior design professionals. The contemporary design collection is the perfect match with our modern furniture collection. 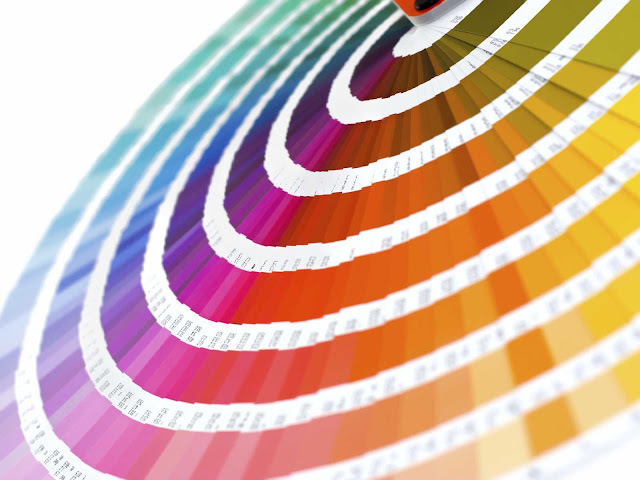 Need design ideas for your modern home? Look no further! 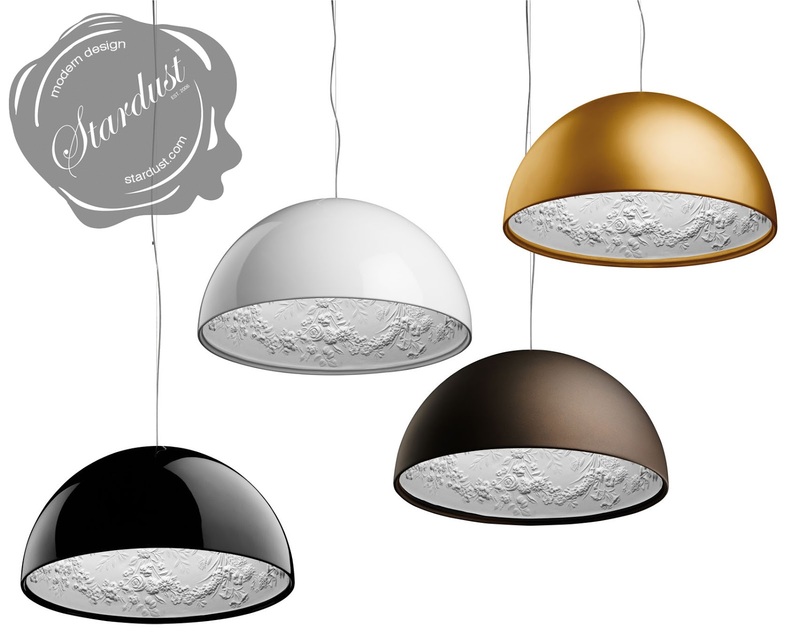 Stardust Modern Design offers a wide array of modern lighting for the home including stunning chandeliers, modern floor lamps, stylish table lamps, contemporary ceiling lights and designer wall sconces.